Part I - We use docker and docker-compose to build a reusable setup for testing java web applications based upon containers. Part II - We introduce Cucumber BDD testing framework along with Serenity framework for providing great tests reports. One of the strong points of using docker is the fact that it gives us the option to think in terms of high level components (database, web container, application, integration container) that we can link together or swap around, sort of like playing with lego bricks. I don't know about advising you to run your setup in production with docker, but it definitely makes sense to base your testing setup on it. Play around with containers swap in a database container with test data, or a web container is a good way of mocking dependencies. Having this option means we can have a simplified view of things that would otherwise seem complex. Add into the picture that you may reuse some of those high level components or just take advantage of some already made => this saves on time with micromanagement of getting those component working or keeping them updated. When doing automated browser testing, I mostly relied on phantomjs as it being a headless browser which has a low consumption of resources. But if we wanted to use some real browsers one would choose something like 'selenium grid'. Selenium grid consists of a central hub which allows nodes with real browsers to register with the hub. 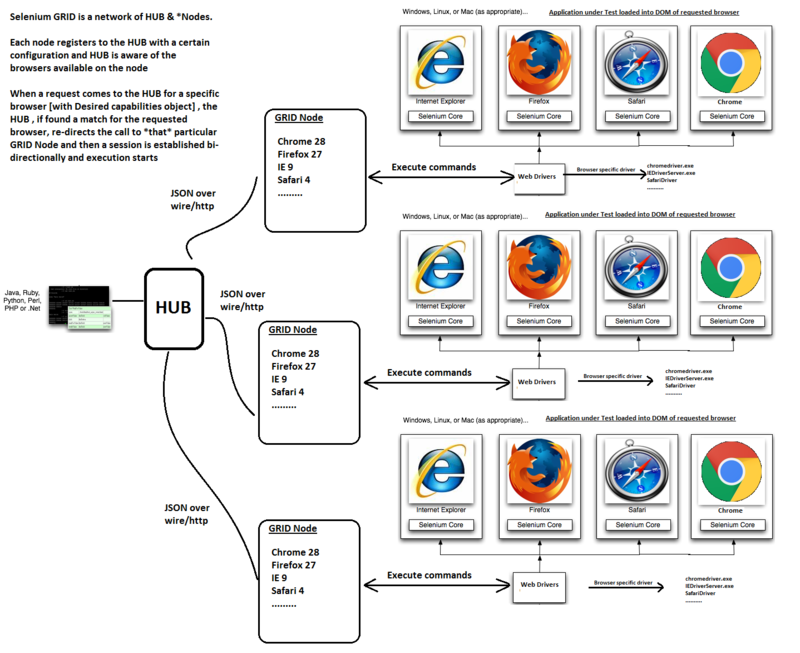 When you want to test you application against a certain browser, you request instances of that browser from the hub and operate(drive) that browser through the hub, which acts like a proxy. Using the selenium grid has the benefits of using actual browsers and if you're registering more nodes with it, the possibility to run tests in parallel. While in your webdriver configuration you need only to be concerned with the selenium hub endpoint, getting the grid up and running it's if not very tedious, at least time consuming. Would it not be cool to have this inside some docker images and ready to run with a single command so that we don't even need to spend time reading the documentation of selenium-grid to find out how or what you need to get it working? the 'selenium-hub' container exposes port 4444 for incoming connections. This is great because now we don't need to worry ourselves to even find out how to get Selenium grid up and running. Questions like: 'Do we need java installed to have it running? What are the commands to launch it?' are no longer our concern. Also, notice the version number '2.48.1', by the time you read this, very probably there will be a newer version available. This means all we'd need do to keep up to date with the latest version of docker-selenium would be to just change just a number - the version of the whole dependency-. We've gone from updating versions number of libraries in pom.xml to updating the version number for a whole packaged setup. We just started the container images through a simple docker command(actually two commands but we'll fix even this further on when we talk about docker-compose :). At this point we at least got a selenium grid up and running through docker ready for a webdriver client to connect to the selenium-hub container on port 4444. Let's go even further in our lego game. In a previous post I proposed a reusable setup of running ui webdriver tests. We basically had a Tomcat container and an ui-tests container. The ui-tests container is actually just a plain java+mvn3 container(we only call it that to better differentiate it in the pictures, or to show that you are not restricted to just java & maven, and you can add any other dependencies). This ui-tests(java+mvn3) container would be used to execute mvn with an external supplied pom.xml which will take an external .war file, deploy it in the Tomcat container(through maven-cargo plugin) and run webdriver tests against the deployed application in Tomcat container. To be clear, the ui-tests container is immutable, an executor of maven pom.xml - the gluecode to deploying the application inside the tomcat container and running the tests in '/src/main/java' and bring in any java dependencies needed to run the tests-. All the dockerfiles necessary to create the images are under docker folder. We're using the angular crud demo of the pippo web framework pippo-demo.war as example for our tests. We've also pushed it to github to be easier to run the tests without having to build it yourselves. ui-tests container is sharing a volume directory with the host through which it receives the pippo-demo.war(pippo-demo.war could be generated by another jenkins job which passes down the build .war artifact to our ui-tests jenkins job), pom.xml and the sources for the tests(which we placed them in '/src/main/java'). ui-tests container deploys the .war file through the 'cargo plugin' into the tomcat container. ui-tests through the shared directory with the host begins executing our cucumber-serenity(discussed in Part II) that it finds there. selenium-hub container acts as a proxy for the webdriver commands it receives from the webdriver tests executed inside ui-tests container. selenium-node container(s) act as browsers opening our application deployed inside the tomcat container executing the webdriver commands received through the hub. Through the shared volume directory we also pass the /src/main/java into which we'll have our cucumber-serenity tests(discussed in part II). I've also used docker-compose in the previous post and it seem I can't get enough :). ui-tests in theory you don't need link with the nodeff firefox grid node, but if not referenced from any other container, docker-compose will see no reason to start it. '- ~/.m2:/root/.m2' is just a speedup optimization that because we destroy and recreate the containers with every run, we don't want maven to download the dependencies again and again for every run, instead we want the new containers to reuse them, that's why we share our home dir maven - could be any other directory mapped to the container's /root/.m2 folder. Structuring our workflow with docker and docker-compose has freed us from the tedious details of setting up a selenium-hub or keeping it updated. We have now have a blueprint setup to use with ui testing for all our java web application. We saw in the docker-compose.yml that it's not hard to have a group of containers talk to each other. This opens the way to add and swap in more containers for mocking dependencies, databases for testing, etc. Take into considerations the cloud providers offering for deploying docker containers and it might just mean we no longer need to concern ourselves with infrastructure even for running testing with actual browsers.